A high-fat diet during pregnancy has the potential to alter a baby's developing brain and increase its chances of obesity later in life, animal studies suggest. The team at Yale School of Medicine, in the US, showed diet could change the structure of mice brains. However, there is evidence that diet during pregnancy can also influence a child's future waistline, such as through changes to DNA. One of the researchers, Prof Tamas Horvath, from Yale, told the BBC: "It could be a signal to the pup that it can grow bigger as the environment is plentiful in food. "We definitely believe these are fundamental biological processes also affecting humans and influencing how children may eventually become obese. "It seems, at least, that this could have a major impact and we need to explore it further in both animal and human studies." 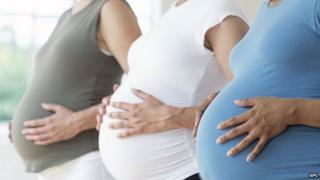 He says a healthy diet during pregnancy may help to break the cycle of obese parents having obese children. Commenting on the findings, Dr Graham Burdge, from the University of Southampton, told the BBC: "Twenty years of research shows nutrition in early life has lasting effects on cardiovascular disease, obesity, osteoporosis and some cancers. It's extremely well established. "This is an intriguing technical advance showing neurological circuits are being changed, which hasn't been shown before." He said the "concept fits in well with the data" but pointed out there were key differences in the way mice and people process fat, so the same might not be happening in pregnant women. He added: "Much of what we know about the process comes from animals. The next big thing is to establish the same mechanisms operate in humans and if we can modify that." For now he advises parents to "have a healthy balanced diet and ensure the diet of your child is balanced as well".